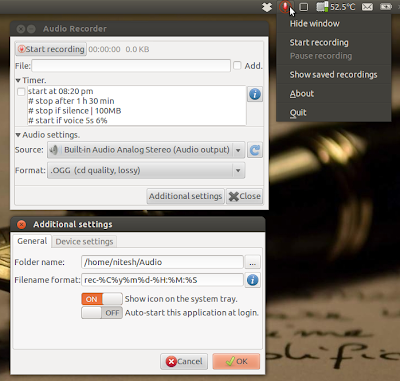 Audio Recorder is an amazing tool for Linux that allows you to record your favourite music and audio to a file. It can record audio from your system's sound card, microphones, browsers, webcams & more. Put simply, if it plays out of your loudspeakers you can record it. This can also record your Skype-calls automatically. Start recording on voice or sound (user can set the audio level and delay). Stop or pause recording on "silence" (user can set the audio level and delay). It can automatically record all your Skype calls without any user interaction. Supports several audio (output) formats such as OGG audio, Flac, MP3 and WAV. Install Audio Recorder by running the commands below. This latest version is available for Ubuntu 12.04 only.